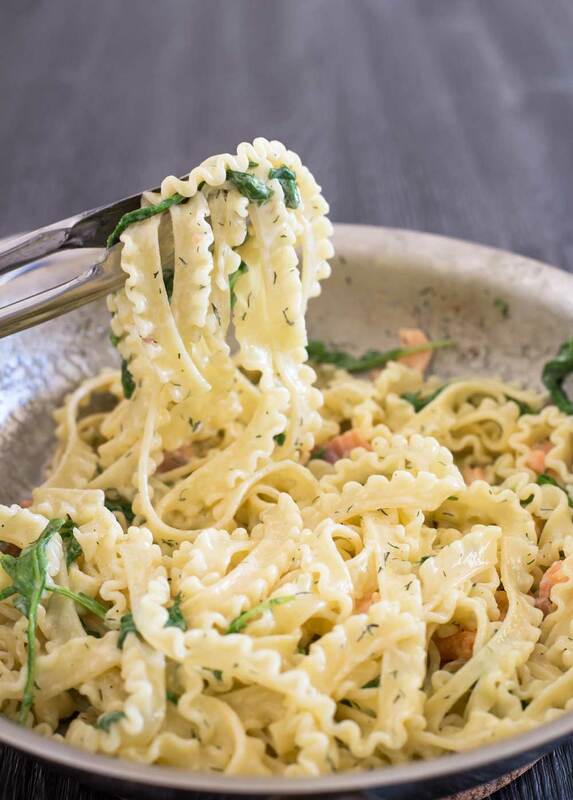 Smoked salmon, cream, dill and peppery rocket are mixed through pasta for a speedy and elegant dinner! Some nights you need dinner in a hurry! In fact most nights in our house we need dinner in a hurry!! There is always something the boys want to be doing. But this is dinner in a hurry when you haven’t prepped anything and you have 15 minutes before your children have a melt down! This pasta dish is what I call a 10 minute supper. Put some pasta on, pour a glass of wine, drink the glass of wine and eat. All in about 9 minutes (depending on your pasta) This is wizardry!!! And it tastes amazing. Nothing about it suggests you made it in 10 minutes! My boys love this, Stew loves this, I love this. It is a please everyone dinner. And being so quick if I know Stew will be later home I don’t mind just cooking it for the boys and starting from scratch again for us later. You can use those packets of smoked salmon off-cuts for this dish. It works out quite inexpensive as a little bit of salmon goes a long way. The flavour permeates the sauce and the dish tastes like there is way more salmon in it that there is. I like to add rocket as it adds a great peppery hit to the dish, but spinach works too. And any pasta works. I love this frilly fettuccine, but linguine, spaghetti or even shells are perfect. Either way, this is so scrumptious! It has to be tried!!!! 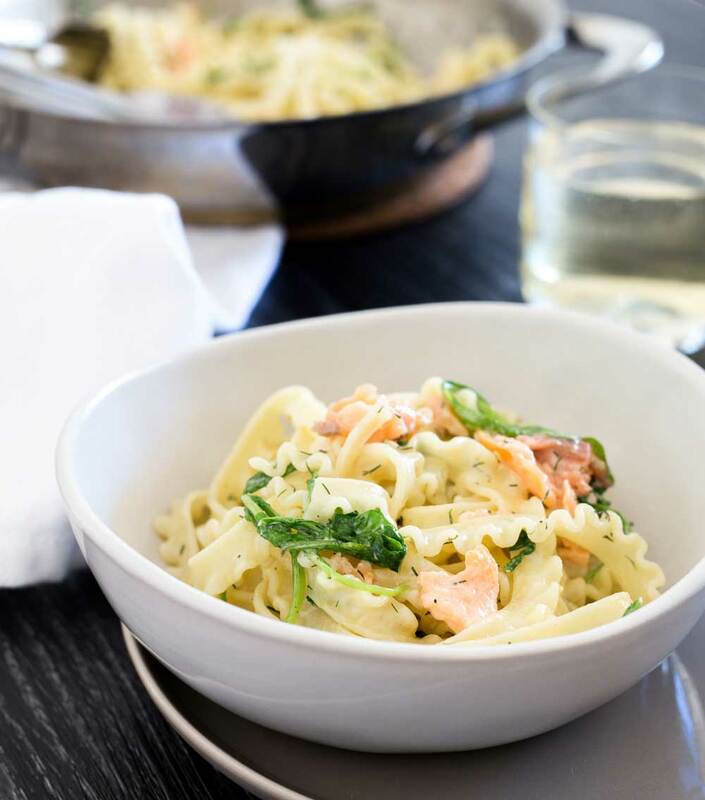 If you love this recipe for Smoked Salmon Pasta why not subscribe to my newsletter, then you can have delicious recipes straight into your inbox. What is more, as a thank you I will send you my soup ebook for FREE! 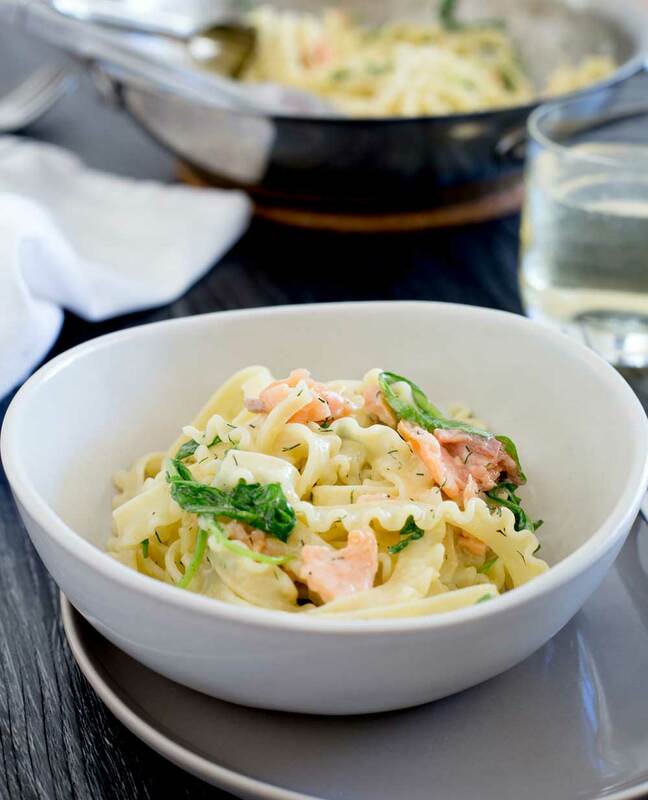 Smoked salmon, cream, dill and peppery rocket are mixed through pasta for a speedy and elegant dinner! Put some pasta on, pour a glass of wine, drink the glass of wine and eat. All in about 9 minutes!!! Wizard! Get a big pan of water onto boil ready to cook the pasta. Salt it generously and add in your pasta. Cook as per the packet instructions. Meanwhile chop the smoked salmon into small pieces and set to one side. Pour the cream into a frying pan, add in the dill and heat it gently. Season with salt and pepper and remove from the heat when it starts to bubble. Once the pasta is cooked, reserve 1/4 cup of the cooking liquid and then drain it well. 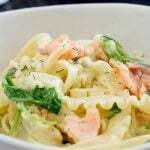 Add the pasta into the cream along with the smoked salmon and baby rocket. Place over a low heat, then stir and lift until well combined. Don't that for too long, you just want the salmon to be warmed through. If the pasta starts to look dry then add in a little of the cooking liquid. When I saw Nagi’s post I sent her a picture of my pasta. I also have a fish and salsa recipe coming up and I think she has a meatball one!!! No worries, thank you! Looks delish! I can’t see the recipe?! Not sure quite what happened there. I went in, refreshed the post and re-saved it and the recipe seems to be showing now.